Alexander Smith shows off his skills to his parents, Tiffany and Daniel, as he reaches out to grab a truck. 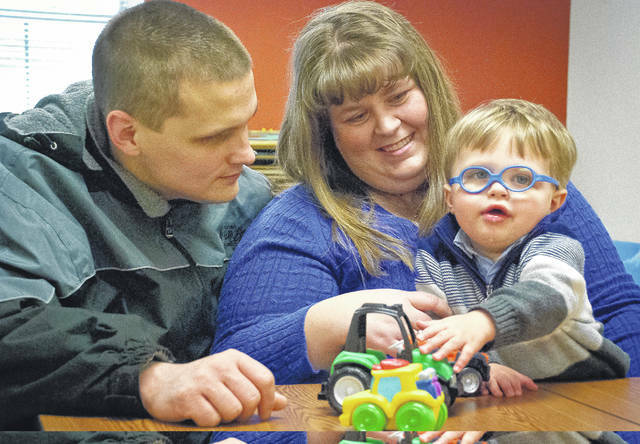 Delaware County Board of Developmental Disabilities changed its program a year ago and that has greatly benefited Alexander and his parents through a team of professional therapists. Almost a year ago, the Delaware County Board of Developmental Disabilities (DCBDD) took a leap of faith in changing the institution’s the Early Intervention Program model. At that time, Superintendent Kristine Hodge said DCBDD was making the move because the staff who were running the pilot program believed in it. Kroon Van Diest said in the traditional program children with a developmental delay were assigned a therapist for each concern. She said the therapists had different schedules, showing up on different days and different times. Kroon Van Diest said families now have a team of therapists who discuss the needs of the children and the families they serve. Kroon Van Diest said having a primary service provider allows for a relationship to be formed with the family. She said if the parents see something unusual the provider brings it up at the next meeting. Kroon Van Diest said in the traditional program the different therapists didn’t interact with each other, causing a disconnect that was frustrating for the therapists and the family. She said it could be two weeks before a family could get services. “We still have some families in the traditional program, but we now have more families in this new approach,” she said. Tiffany Smith is the mother of 2-year-old Alexander, who is a special needs child. She said she sees Alexander’s primary service provider once a week. Smith said because the team is talking about Alexander in the meeting, his speech therapist is already aware what’s going on and what progress he has made. Daniel Smith, Alexander’s father, said a therapist coming in one hour a week isn’t going to make the great improvements. Kroon Van Diest said DCBDD has three teams currently in place around the county. This entry was tagged DCBDD, Delaware County Board of Developmental Disabilities, Kroon Van Diest. Bookmark the permalink.